Washington D.C. council has postponed a vote to change the city’s contributory negligence laws to comparative negligence with regards to automobile-bicycle collisions. This decision has frustrated bicyclists and pedestrians because under the current contributory negligence framework, the victims of such accidents are not entitled to recovery. Under contributory negligence laws, if the victim is viewed as being at least partially responsible for the accident, they will not be awarded damages. D.C. has a “pure” contributory negligence system, which means that even if the victim of the accident is 1% at fault, they may not recover from either the driver or insurer. This is a very strict standard and in most circumstances denies any form of compensation to victims of such accidents. The only time the damaged party may recover is if their behavior which led to the accident was non-negligent (meaning entirely free from fault) and that the driver was negligent. It is very difficult to establish non-negligence. In general, the United States as a whole has been transitioning from a contributory negligence framework to that of comparative negligence over the last few decades. Aside from D.C., only four states have stayed with the contributory negligence system. Under a comparative negligence approach, the victim can be compensated even if they are partially at fault; however their recovery will be deducted by the percentage for which they are at fault. This seems like a far more reasonable approach than the other more stringent standard that is slowly fading out. For the driver and the insurance companies, contributory negligence is ideal because they will not be held liable whatsoever. This of course is a double-edged sword. Victims prefer the comparative negligence standard, but there is a nefarious element to this. Victims surely will be awarded damages under the comparative framework. However, there have been instances where bicyclists and/or pedestrians have intentionally come into the crosshair of the driver simply to recover damages. One of the reasons contributory negligence exists is because politicians and congressmen such as D.C. Councilmember Kenyan R. McDuffie want to provide safeguards against such acts. The driver should not always be held responsible, for there are times when the victim is in fact the perpetrator. 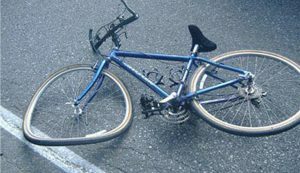 News reports and various statistics, including one from Gallup, show that states which enforce the contributory negligence standard have far fewer cases of automobile-bicycle accidents than states with comparative negligence. Obviously, statistics only provide a glimpse of the truth but they should be given some thought. This statistic implies that bicyclists under this framework are more wary of accidents because of the fact that they will not be awarded damages, and it also has a deterrent effect on those “particular” bicyclists/pedestrians that want to fill their pockets by intentionally engaging in vehicular accidents. Of course, even under those states that apply comparative negligence, they are not all uniform. There are variations on comparative negligence; for example, there is something known as “pure” comparative negligence and another common variant is the modified comparative negligence scheme. Under the “pure” comparative system, which is the typical approach, the victim may recover, but recovery will be reduced based on the degree of fault. In the modified system, there are two approaches. One is if the victim is 50% or more at fault, then they cannot recover whatsoever. The second approach is that if the victim is 51% or more at fault, then they cannot recover. The difference between the two approaches is a mere 1%. In general, the modified system is far less favorable to the damaged party than is the pure comparative system. Just to reiterate what has already been stated, D.C. transitioning from one system to another can have drastic implications. For one, as mentioned above, the comparative system favors the victims and the contributory framework benefits the driver and/or insurer. The people of D.C. are unhappy that the vote came out the way it did, as they would prefer to be compensated in the case of an accident. They don’t want the insurers walking all over them. The contributory negligence framework allows for this and gives the insurance companies an excuse not to cover the damages. At its core, these two diverging systems provide a mechanism that a defendant can invoke if he or she is sued. On the other hand, there are nuances to the law that prevent full protection for one party or the other. Ultimately, the law of the state will determine how both perpetrators and victims of accidents will be treated. The country is headed towards a comparative approach but as is the case here in D.C., not all legislators are ready to give up on contributory negligence. There are repercussions that go beyond benefiting the insurance companies. The comparative negligence framework might lead to increased insurance premiums and this potential effect is not ideal for the many decision-makers that want to maintain their seat on the throne. The comparative negligence approach seems like the more reasonable approach because it gives the victim of an accident some form of remedy. It gives certain remedies to the driver and the victim depending on the circumstances. The driver may not be penalized fully if the damaged party was somewhat responsible and the victim will be rightfully compensated.